Devoted to the Exposition of Nature, Physical, Spiritual, Divine. 2/1, January 4, 1851-3/25-26 (no. 78), December 13, 1851. 8 pp. Continues volume numbering of La Roy Sunderland's Spiritual Philosopher which he claimed was the first spiritualist journal in the world. 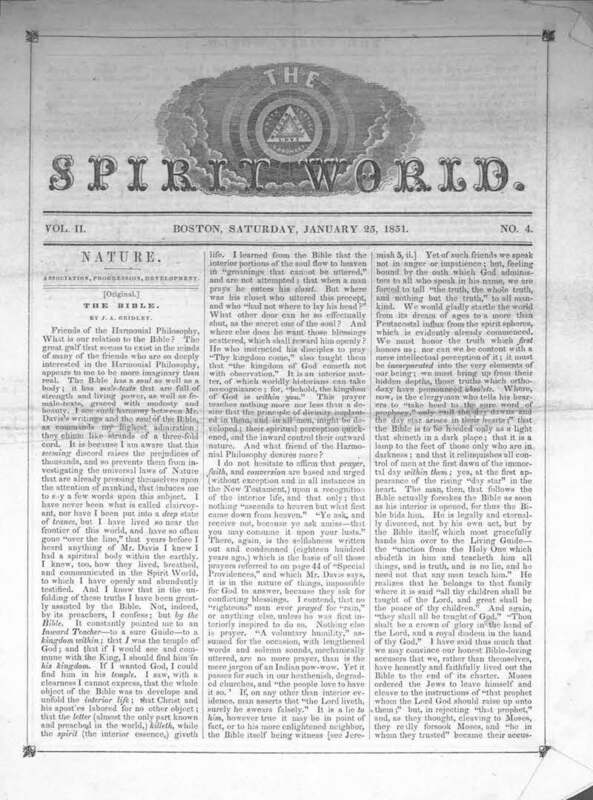 During his editorship of this journal, Sunderland was the subject of one of the most famous of early exposes of spiritualism when a reporter sent him an illiterate note, with $1.00, purporting to be the request of an aged woman desiring to communicate with her dead daughter. Sunderland obliged and acting as his own medium sent the inquirer a message from the dead daughter. The daughter was a figment of the reporter's imagination, however, and the letters graced the front page of the newspapers. Sunderland kept the dollar. The journal was divided into sections: "Nature. Association, Progression Development"; "Pathetism. Physiology, Psychology, Phrenology"; "Spirits. Parental, Immortal, Happy," etc. Regular contributions by A.J. Davis, W.S. Courtney, J.A. Gridley, et al. Harvard University; Trinity College; American Antiquarian Society; Skidmore Library, Lily Dale.